Many thanks to Anders Sejr Hansen and the rest of the O’Shea Lab for all of their help! I learned so much about experimental biology, and I am grateful for the exposure to techniques in molecular biology, microscopy, and image analysis! For this work, I was named an HHMI Interdisciplinary Undergraduate Fellow. For the fellowship, I worked with a professional animator to describe some of the premises of image analysis in biology. The final animation can be viewed here. Abstract: The cell maintains an arsenal of genes which are activated by transcription factor (TF) proteins only in the presence of the proper stressor. 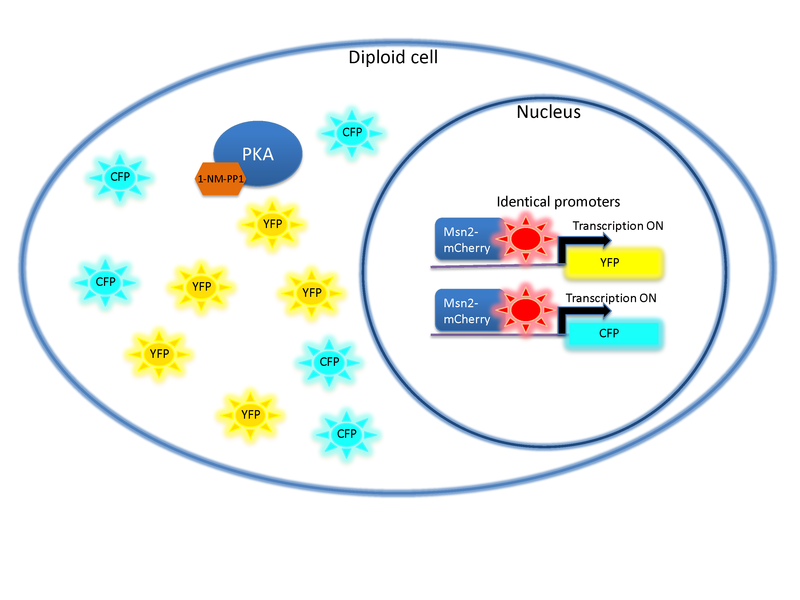 Upon stress, the eukaryotic cell activates certain TFs, which then translocate to the nucleus, where they can bind to promoter sequences and induce expression of the appropriate genes. How the cell responds to these changes in transcription factor levels in the nucleus is less obvious however. Our studies focused on Msn2, a TF in budding yeast responsible for mediating the response to a number of stresses, such as oxidative stress and starvation. Based on the identity of the stressor, Msn2 enters the nucleus with different patterns, such as entering and leaving the nucleus rapidly or periodically. Our project’s goal was to elucidate how the positioning of histones within promoter sequences allowed genes to be differentially activated by these various signals. We selected the DDR2 gene promoter, which possesses Msn2 binding sites both in and out of its well-defined nucleosome binding positions. Then, we systematically modified the position of its binding sites relative to the nucleosomes and utilized a fluorescent reporter that allowed us to quantify relative expression levels. We focused on how the promoter processes three aspects of the incoming Msn2 signal: the duration (how long Msn2 is present in the nucleus), the intensity (the maximum amount of Msn2 within the nucleus), and the frequency of oscillations (how quickly we move Msn2 in and out of the nucleus). We then fit these results to a set of differential equations describing how transcription factor binding can lead to protein production. With these results, we hope to identify how all of these binding sites cooperate to analyze complicated Msn2 signaling.